John Edward Shelton was a local footballer, born in Wolverhampton and a 1908 FA Cup winner with Wolverhampton Wanderers Football Club (or “English Cup” as it was then). 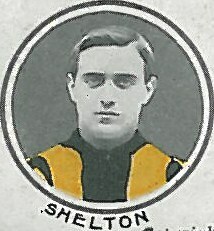 Shelton was born in Wolverhampton in 1885. His Wikipedia page states that he made 94 appearances for Wolves, scoring 17 goals, and earned the team a replay against Bradford city in the FA Cup Third Round in the 1907-08 season. He played in the Club’s 3-1 victory over Newcastle United in the Final. He joined Port Vale in 1911, and made 139 appearances for them until he was conscripted in 1917. He married Sarah Nicholls in 1911, and they went on to have two children, John E. T. (1912) and Sarah E. (1914), both born in Wolstanton. He joined the 2nd Battalion of the Lincolnshire Regiment (service number 52065). Shelton was killed in action on 7 September 1918, and is commemorated at the Epehy Wood Farm Cemetery in France. His widow later married Jack Needham, another former Wolves player.